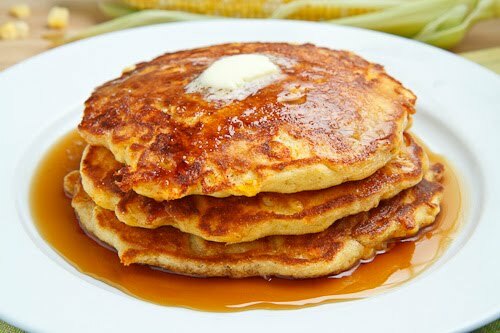 Pancakes with fresh, juicy corn kernels and melted cheddar cheese. Great either sweet when drenched in maple syrup or savoury topped with spicy salsa and tangy sour cream. Right now we are smack dab in the middle of corn season and I have certainly been enjoying it! Mostly I have just been eating it off of the cob simply dressed with melted butter and some salt but I wanted to use some corn in a recipe. Normally when I think about corn I am thinking about recipes for dinner but this time I was thinking that it would be interesting to use corn in a breakfast and I knew just how to do it. I had recently made some blueberry pancakes and I figured that fresh corn pancakes would also be great in pancakes! For the recipe, I pretty much just went with my blueberry pancake recipe and I replaced the blueberries with kernels of corn. This recipe was the perfect choice as it also includes some cornmeal which goes perfectly with the fresh corn from the cob. I did make one little change to the recipe and that was it include a healthy helping of cheddar cheese. When I made the ham and egg crepes with gruyere and maple syrup not too long ago I discovered that the sweet and savoury combination of maple syrup and cheese works really well and I could not resist using it in the corn pancakes. 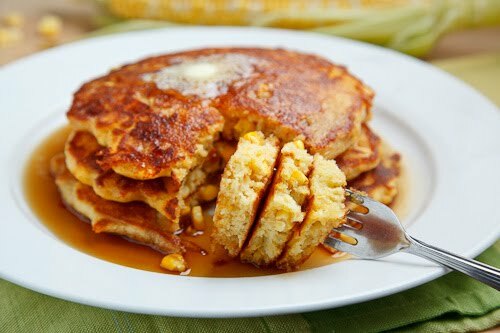 The fresh corn pancakes turned out amazingly well! The pancakes were nice and thick and light and fluffy and good! The sweet corn, maple syrup and cheddar combination turned out to be magical and I certainly did enjoy my breakfasts last week. 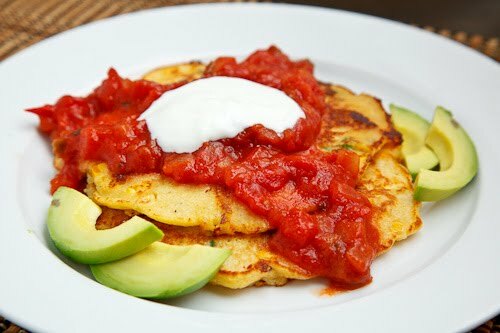 While I was eating my corn pancakes I realized that they would also do well with a savoury topping and I figured that salsa and sour cream wold be perfect! With that thought, the next morning I tried the savoury version and I was immediately hooked and I enjoyed the savoury version for the remaining breakfasts of the week. On the last day I realized that I also had some green onions and jalapeno peppers left over and so I added them to the pancakes as well and I have to say that that was my favourite version of the pancakes from the week. Mix the flour, cornmeal, baking powder, sugar and salt in a large bowl. Mix the milk, eggs and butter in another bowl. Mix in the corn and cheese. Looks just fabulous (as usual). Can't wait to try it! Just found your recipe for the butter chicken and recommends….that sounds great too! I haven't tried one of your recipes that hasn't been a hit with family or friends. I appreciate all the tips too! I'd never though of using almond butter in an Indian dish but it makes perfect sense. You know the food! wow! those pancakes look awesome! We are in high corn season as well, and I can't seem to get enough! 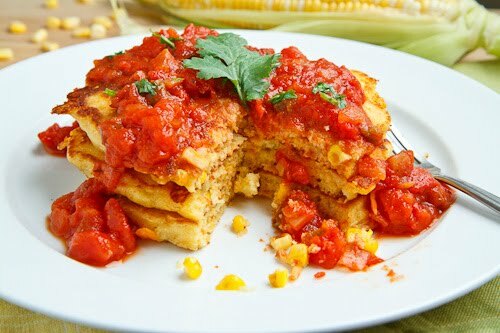 I have savory corn pancakes on the dinner menu for tomorrow night, but I think I might have to have some for breakfast and lunch as well! These look delicious!!! I need to make these asap! These remind me of the corn fritters my mom used to make for us as kids. They were so stinking good but fried in oil, so I bet these are healthier – and made with fresh corn, yum! Gorgeous! Love how fulfilling these look. I now will have a difficult morning wishing I was eating these. Hi, I’ve been reading your blog for a while now and I gotta say, its the best study break when I’m stuck in the library studying for exams. It has inspired me to start my own blog, so I just wanted to say thanks for all the interesting posts, its really challenged me to get interesting with my food! I know I would enjoy the adition of the cheese in these pancakes. Love the sweet and savoury. You should have poured "corn syrup" on these pancakes! Fiquei a babar…só de olhar para estas belas fotos, que maravilha!! I love the versatility of these and that you can make them either sweet or savory depending on your mood! 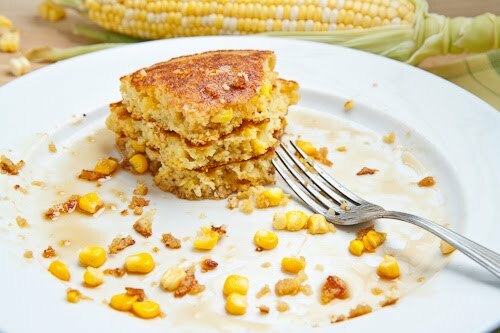 I adore corn, and these pancakes look like a great recipe featuring the sweet summer veggie. I especially love that they can go either sweet or savory! Pancakes made with cornmeal are my favorite but these just might be a close second. Oh Kevin! You really must try corn ice cream. After cutting corn from the ears I simmered my (8)cobs in 2 cups 1% milk maybe 1/2 hour and strain and chill the milk. I added 1 can sweetened condensed milk, 2 cups 1% milk and seasoned this with a pinch of cinnamon and 1 tsp Mexican vanilla. Process in ice cream maker. You will not be sorry! Penny Wolf: Corn ice cream is so good! A great way to cool down on a hot summer day! I recently made corn pancakes, and added salsa. It's amazing!!!!! And corn and maple, I can only imagine how delicious that tastes!!!! Must try soon! This looks yummy! Gotta to try this! what a fabulous idea! I'm even picturing them with maple syrup and crumbled bacon for breakfast. thanks for this recipe!! This is a fab idea! Great way to use up corn! These pancakes sound so amazing! I love how you came up with so many different ways to serve them over the course of the week. All of it sounds delicious! OH MY GOSH!!!!!!!! SO GOOD!!!!!!!!! I'd never think about this! I just made corn cake and this sounds absolutely wonderful! YUM! Kevin, you have a true gift for combining foods… have fun in New Orleans! What a wonderful idea! The concept of corn pancakes is new to me, but it sounds delicious. The photo with the salsa on the pancakes makes my mouth water. Thanks! I have been eating corn like crazy – and these look like a great way to enjoy corn even more!! So many ways to enjoy! I must try this soon! These look so divine and not heavy at all. Love it! That looks so gorgeous and yumm… Will I ever get to dig that? Sigh! We got nopales in our CSA this week and I went hunting around the internet for inspiration. I just found it with these pancakes!! Wouldn't they be great with some cotija and monterrey jack cheese over the top, along with a nopales and tomatilla salsa? 🙂 Thanks for the idea!